I began my serious interest in Astronomy in the early 90's. I purchased a 6" reflector telescope, and, only as an afterthought, bought a used 7x50 Bushnell binocular. Every time I used the telescope I had to lug the mount outside, then polar align the eq mount, choose the right eyepiece out of the 4 in my assortment, and then finally, usually, spend 10 to 15 minutes scanning the night sky for the object I wanted to look at. Using the binocular on the other hand, I could almost always find the object of interest quickly and easily, and, of course, there was no set-up time to consider at all. It got to the point that I used the binoculars three or four times as often as my telescope, due mostly to their convenience and ease of use. The only problem was that everything, other than the largest open star clusters, seemed so SMALL in my view! SO, at that stage I did what many amateurs do in similar circumstances. 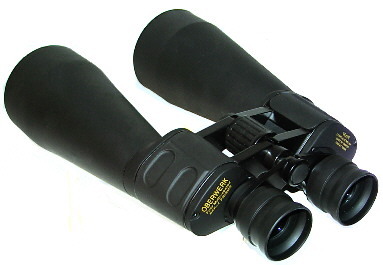 I sold the 7x50s and bought a larger and more powerful 15x70 binocular. This change helped with my ability to see many items more clearly, from the Andromeda Galaxy to the Pleiades, and many more. However, I soon noticed there was now some definite arm strain and I could barely hold them steady. With the realization that my recent change would be enhanced by another change in my approach, I invested in a steady, adjustable Binocular Mount, with a parallelogram-type swing arm. Now, since I had such a good mount, I felt it was the normal course of things that I should upgrade again, so I invested in a larger, more powerful (and a bit more expensive) 20x80 binocular. Now my view of the nighttime sky was quite good on all but the very smallest objects I looked for…but now I had almost as much work and time setting-up my binocular and mount as I did with my telescope! 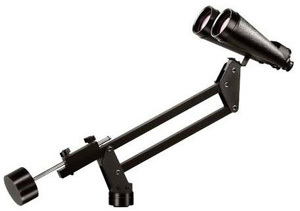 Since I still liked to use my telescope (by now, I had moved to a 120mm short-tube refractor on a very convenient alt-az mount) it meant that to use the binoculars also required hauling and using TWO separate mounts — which was both time consuming and very bothersome. At about this time, I tried a friend's 12x50 binocular. I found that it had most of the advantages of my previous 15x70 instrument, but with much less weight. I could hold them fairly steady for up to ten minutes at a time! 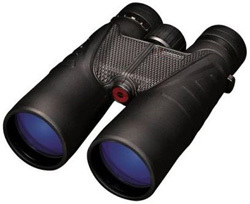 Some web browsing turned up a good online source for binoculars at reasonable prices and I found a good price on a roof-prism type 12x50. I must admit I spent as much as I could afford at that point, since by this time I had become pretty picky about optical quality. After a couple of months of use, I find these suit me very, very, well. Perhaps it's because of my age (just shy of 70), but I find I can make do just fine with a 4mm exit pupil and the extra magnification is very apparent — especially over a 7X type. Convenience-wise, they are tops. My only accessories are a star chart and LED penlight with red cellophane filter. The star clusters are mostly resolved with this binocular (except for the very tight ones) and I can make out some detail in M31, as well as the satellite galaxies, on a good night. As a side benefit, they are very useful for sightseeing, too, and helped me spot a full-antlered elk and a few eagles on a recent trip to Colorado. In retrospect, this solution works well for me and seems obvious, although it took me over ten years to arrive at it. I guess anything worthwhile has to be learned the hard way, by personal experience. It's a treat to follow along with your story as your interest develops in astronomy and then to share in your experiences with binoculars of varying design and configuration! It's our guess that there are a lot of us either with experiences that are already somehow similar or who will have experiences that are similar in one way or another as they experiment to see what works for them. Of course, there will be others who will see things a little differently and that's what makes life so interesting! We count it a joy and a privilege to meet others with experiences that differ from ours — even if they only differ a little bit — because that's when we find ourselves learning something new. If you're willing, Norman, we wouldn't mind at all if you'd like to share a particular experience you've had while enjoying binocular astronomy. It's our guess that you have several that would be both interesting as well as helpful!